ORLANDO, Fla. — The proposed contract Walt Disney World's unionized workers will vote on next week would increase the starting minimum wage by at least 46 percent over three years to $15 an hour, while enabling Disney to use more part-time workers and require new workers to stay in their positions longer before transferring, according to new details released Monday. "There is no question in my mind that our members are proud of this historical agreement and their vote will reflect that," said Matt Hollis, the new president of the Service Trades Council Union, the coalition of unions. If the contract is ratified, each Florida worker will receive a $1,000 bonus that Disney had paid to other employees after last year's tax cut by Congress. "I hope it's a deal everybody likes. It took a long time and ultimately everybody came together and we will be making more money," said Ed Chambers, who headed the Service Trades Council until recently. Union activists all over the country have been pushing for a $15 an hour "living wage." 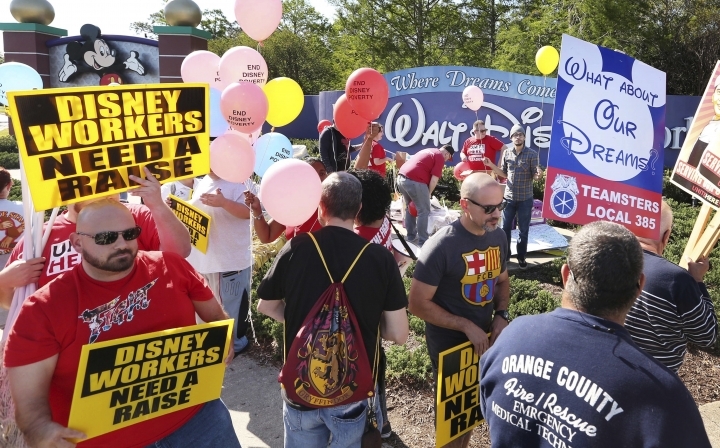 Disney's wage decisions have historically influenced other employers in the tourism mecca of Orlando where the industry is competing for workers in a time of low employment. Last month, Disney agreed to raise the minimum wage for 9,700 employees at its California theme park resort to $15 an hour. In a statement, Disney officials called the Florida deal "the largest proposal ever offered" by the theme park resort. "We are thrilled our cast members will have the chance to vote on what is one of the highest entry-level service wages in the country," said Robbin Almand, vice president of labor relations for Walt Disney Parks and Resorts.